It’s no secret how much i absolutely love housing in my MMO’s. It’s a game feature that can not only add hours upon hours of replayability but can also drive an economy. This is one of the main features often overlooked or tossed aside as simply “fluff” in today’s MMO’s. This is a huge mistake and one i think game devs are starting to realize. Rift realized this and eventually implemented dimensions not too long ago. GW2, on the other hand, missed a golden opportunity to launch with housing in place. They had the perfect platform for it as well. Our personal story area would have been the perfect location to include housing, farming, or even some sort of horse or mount breeding. I’m more than positive that this is coming in some form or another, perhaps in the first expansion which should be sometime around the corner. This is also why I’m so excited about Wildstar and the possibilities it seems to be bringing to housing. A new MMO, launching with housing from the start? What world are we living in?! It’s obviously still early and we really don’t have any idea of the overall scope of their housing, but it’s nice to see another studio taking this feature seriously. My first experience with housing was FFXI. Everyone had an instanced room that we could not only decorate but also served as a storage hub and a crafting location. I spent hours upon hours just moving furniture around, though my options were limited items wise. Doing more with less isn’t always possible. EQ2, on the other hand, is absolutely ridiculous when it comes to it’s housing. The sheer amount of options and possibilities is mind boggling. Just by the amount of items in the game, which exceeds thousands on the auction house, you’re only limited by your creativity. 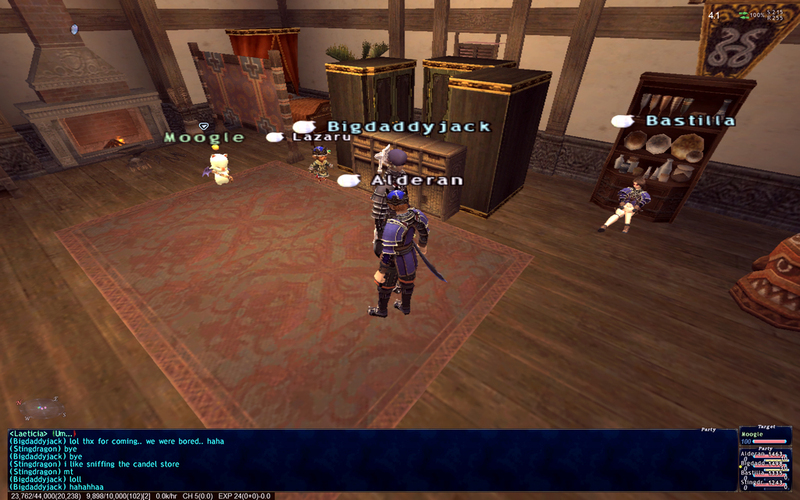 EQ2 has by far the best instanced housing system I’ve ever seen and it’s not even close. I’m talking about actual books that are player made, and lots of them. I can only hope that another studio takes this and somehow expands on it. Here’s my standard Neriak 7 room house. It’s nothing special since i haven’t been playing that long but i have managed to acquire some nice quest items such as pets that wander around. Good thing i don’t have to clean up after them! Although my little whirly-gig likes to fly around and shoot some of them. My recreation of Stonehenge on my balcony would have made Nigel Tufnel proud. Prestige housing is in another league way above my capabilities currently, but they show what’s possible. Housing leaderboards allow anyone to visit and walk around others players creations. I ran across one that i was blown away by called Avi’s Iceshard Keep. Amazing if you ask me. Hopefully we see more and more studios not only embrace housing in the future, but take it to the next level. Give us something we’re totally blown away with. Give us creation and building tools. Give us more non-combat options to entertain ourselves. More options are always better when it comes to MMO’s.